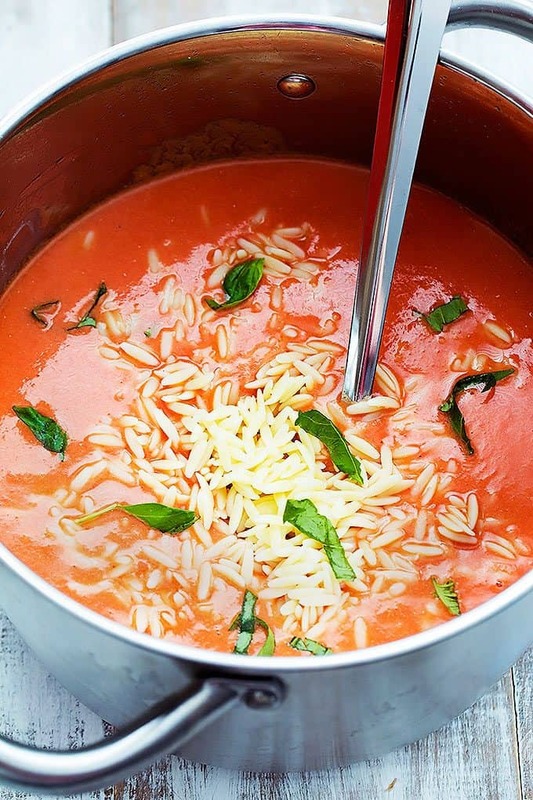 Savory, light and healthy Tomato Basil Orzo Soup with delicious little pasta’s and basil flavor throughout – ready in just 30 minutes! Are you one of the lucky ducks that was graced by a giant storm this weekend? If you’ve been hanging out on Instagram for even two minutes the past couple of days then you’ve seen snow galore across the country. We got a storm. Not a blizzard, but we have several inches of fluffy white stuff in our front yard and I spent 90 percent of my Sunday afternoon in fuzzy socks and my favorite sweater looking out the window at it. Isn’t that the the definition of soup weather? I love tomato basil something fierce and I’ve now discovered I love it even more laced with orzo pasta. If you’ve ever tried the Zupas Cafe version then you probably already knew that tomato basil and orzo go together like chocolate and cake. But I’m a little late to the game on this one. Forgive me and join me for a very large bowl of this heavenly soup mmkay? 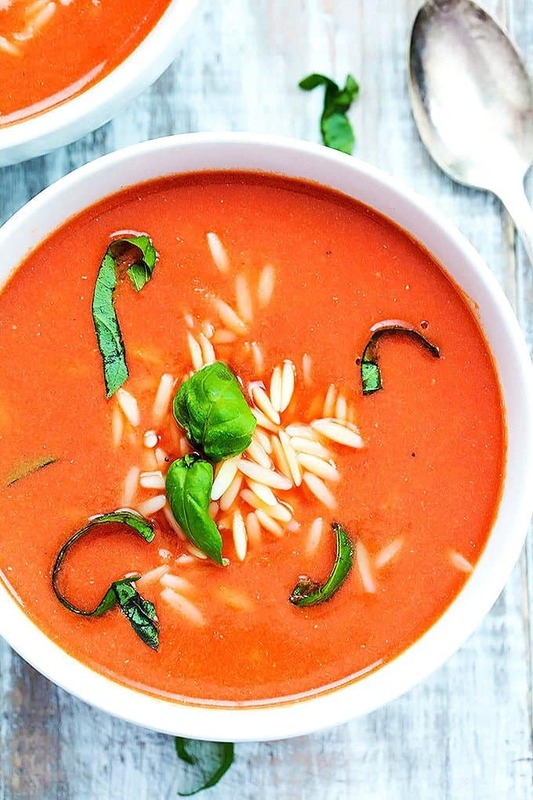 Savory, light and healthy tomato basil soup with orzo pasta - ready in 30 minutes! In a large pot melt butter over medium heat. Add garlic and basil and saute til fragrant. Add tomato sauce, broth, and milk. Bring to a boil, then reduce to a simmer and allow to cook for about 10 minutes. Stir in orzo and salt and pepper to taste. Garnish with additional basil if desired and serve. 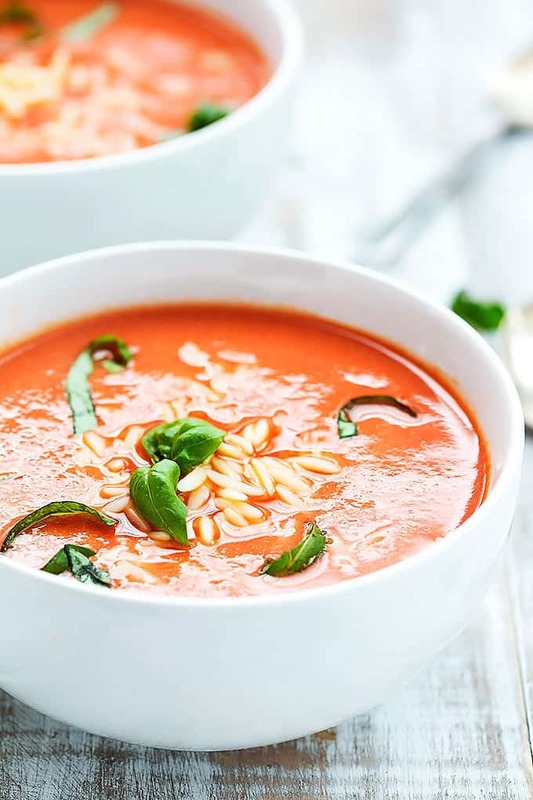 Try these other Soup Recipes you'll love! wow the addition of orzo looks delicious! Enjoy your lazy snow days, that’s the only part we Im jealous we don’t get in southern california!